Every Tuesday I turn over the site to a different Midtown Lunch’er for his or her recommendations for the best lunch in Midtown. 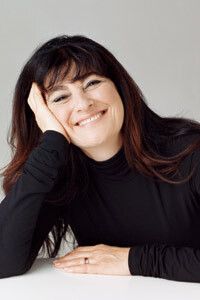 This week I couldn’t be more excited to have Ruth Reichl, the Editor in Chief of Gourmet Magazine, which just so happens to be the media sponsor of “Street & Savory: A Global Street Food Festival” on Monday night to benefit Citymeals-on-Wheels. The event is in Rock Center and will feature street cart inspired fare by a long list of famous restaurant chefs as well as food from some of our favorite street vendors, like The DessertTruck, The Treats Truck, Red Hook Ballfield Vendors and (the one I’m most excited about) the Los Angeles based Korean taco truck: KOGI BBQ. Get more info about the event, plus register to win a pair of tickets (valued at $1200!) after Ruth recommends her favorite spots to eat lunch in Midtown. Favorite Kind of Food: There is almost nothing I won’t happily eat. Least Favorite Kind of Food: The only thing I won’t eat is honey. Favorite Place(s) to Eat Lunch in Midtown: The Mysore masala dosa, saag paneer, and brinjal bhartha at Minar (on 46th btw. 6+7th.) White rice, chicken, all the vegetables, no white sauce at the Halal Chicken Curry Cart (on 43rd and 6th.) Kalbi, bibimbap, yukgaejang, and soondubu from Kang Suh (on B’way and 32nd.) The spicy tendon from Wu Liang Ye (on 48th btw. 5+6th.) Ma po tofu and twice cooked pork belly from Szechuan Gourmet (on 39th btw. 5+6th.) Spaghetti neri with squid, crudo, fried blowfish tails, grilled fish, fish soup from Esca (on 43rd & 9th.) Chawan mushi with uni and omakase sushi from Sushi Zen (on 44th btw. B’way+6th). Lasagna, pasta, and salads from Insieme (on 7th Ave. and 51st.) And Le Bernardin (on 51st btw. 6+7th) is pure luxury; everything is fabulous. “Go-To” Lunch Place You and Your Coworkers Eat at Too Often? We order in from Grand Sichuan. I’m addicted to the peppers in black bean sauce. Place(s) you discovered thanks to Midtown Lunch? Taj Delhi Chat (now called Khodiar Chaat, on 6th Ave. btw. 37+38th) — how did I miss this? If you could work anywhere (just because of the lunch) where would it be and why? Singapore. Need you ask? Best street food on earth. I could eat carrot cake (no carrots, no cake, spicy not sweet), every day. Is there anything you’d like to ask the Midtown Lunch readers? Is there any great Mexican food in midtown? After 10 years in LA, I’m always hungry for real Mexican, and I have yet to find it. Tickets start at $600 each, but using this discount link from Serious Eats: New York you can purchase tickets for $450. I know it’s expensive, but all the money goes to a great cause (Citymeals-on-Wheels), it’s tax deductible, and this lineup of food is probably the best you’ll see at one of these events all year long. If you can afford to go, consider buying tickets to support this great charity. If you can’t afford the $450, but you really want to go to the event, and support the cause in some way, call the City Meals on Wheels event line at 212-687-1290. I’m sure they will be happy to try and work something out. The comments will close, and the winner will be contacted at Noon EST on Friday (6/5). And as always if you want to be next week’s Profiled: Midtown Lunch’er (or know somebody you’d like to nominate), email me at zach@midtownlunch.com. Posted by Zach Brooks at 11:45 am, June 2nd, 2009 under PROFILE: Midtown Lunch'er. I need to get out more and expand my midtown lunch horizons. And best streetfood….Thai or Vietnamese pissibly Hongkong. $450 you have to be taking the piss……what are they serving,unicorn? I love Burrito Box on 9th ave. Amazing grilled chicken burritos that are almost too big to finish and all the free chips and fresh salsa you can handle. Ruth, I love all of your books, and if you ever need a companion on your lunch trips to Esca or Le Bernardin, sign me up. For Mexican food, it’s a little far from your office, but definitely check out El Rey del Sabor and just ask them to give you whatever is fresh and delicious that day. They’re so friendly and the food is great. Finally, every seafood dish at the meals-on-wheels event sounds amazing. In Midtown, Tehuitzingo on the West Side and Pampano Taqueria on the East Side. I just came back from Mexico last week and vouch that Pampano is close to the street tacos I’ve had while I was there. A bit below midtown, but easily accessible at 23rd and 6th is Grand Burrito, a hole-in-the-wall Mexican and pizza(!) place. Pretty authentic stuff (by NYC standards, at least) and they have tortas and huaraches too. Being open 24/7 is another plus! Check out the new Fresco Tortillas located at 819 2nd Ave on 44th st. Its pretty solid Tex Mex and very cheap. El Rey de Sabor. Never fails. For great Mexican try: Hell’s Kitchen 679 9th Ave (between 46th St & 47th St) New York, NY 10036 .. you’ll adore the Duck Confit Empanada! gotta go with tehuitzingo for inexpensive and tasty. and it’s in the back of a bodega! I highly recommend La Paloma on 45th and 9th. It’s been a while since the last time I went, so I don’t know if she’s still there, but the tamale lady in front of the Mexican consulate used to be my Mexican go-to place. Hey, Ruth, we are building-mates. I work in the poorly dressed upper half. I think we should be friends. You’re dreaming the impossible dream with the Mexican food. As a co-former Angeleno, the Portuguese have a great word for what we, the Mexican food lover diaspora, suffer from. It’s called “saudade.” That, and we also suffer frequent indigestion. In a pinche pinch I like the carnitas as Tulcingo on 10th, and their soupy-spicy aguacate salsa helps cover the defects. You seem to share my love of Sichuan. Tried the Dan Dan noodles (extra spicy) from Wu Liang Ye last night and thought they were great. But everything else at Szechuan Gourmet and Grand Sichuan are so much better. Does Wu Liang Ye actually have any good entrees? I can’t afford the $450/ticket so I’m commenting. Let me second Tulcingo del Valle on 10th and 47th; that’s a pretty good corner generally for Mexican food.